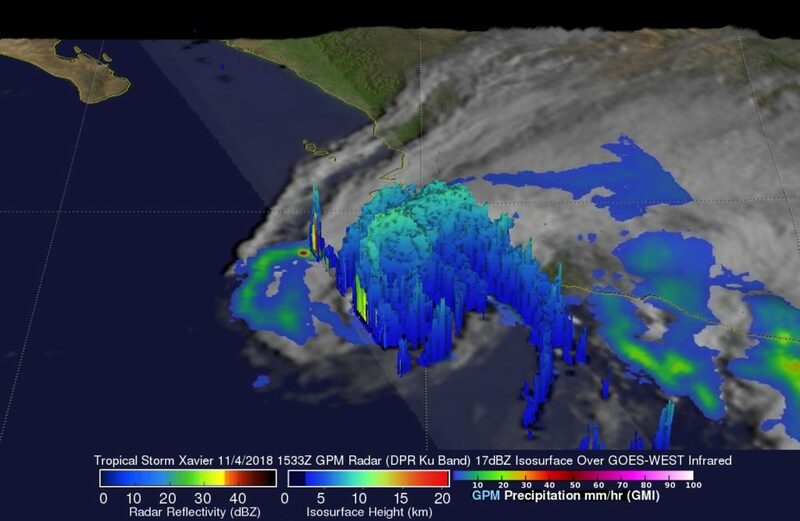 As Tropical Storm Xavier continued to rain on western Mexico, the Global Precipitation Measurement mission or GPM core satellite analyzed the rate in which rain was falling. The next day, Nov, 6, Xavier had weakened to a remnant low pressure area. The GPM core observatory satellite passed directly above tropical storm Xavier’s low level center of circulation on November 4, 2018 at 11:33 a.m. EDT (1533 UTC). At that time Xavier was located in the eastern Pacific Ocean less than 150 nautical miles (277.8 km) south of Puerto Vallarta, Mexico. Xavier was experiencing strong southwesterly vertical wind shear. 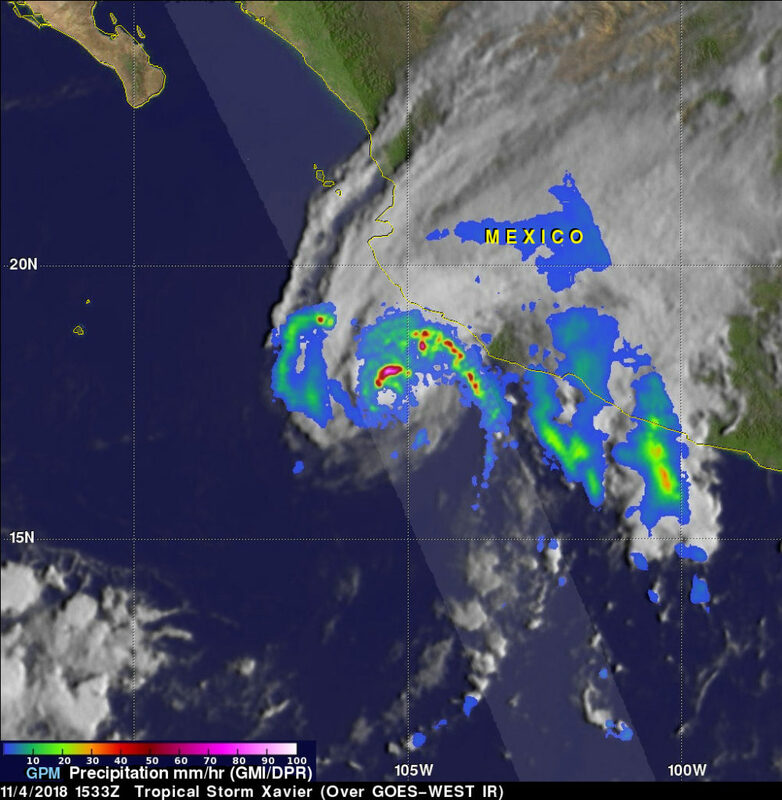 The low level center of circulation was located well offshore while the tropical storm’s deep convection had been pushed toward Mexico’s coast. GPM’s Dual-Frequency Precipitation Radar (DPR) revealed that rain was falling at over 9.5 inches (241.3 mm) per hour in some of the powerful convective storms that were located to the northeast of Xavier’s low level center of circulation. At NASA’s Goddard Space Flight Center in Greenbelt, Maryland a 3D image of Xavier’s precipitation structure was created from data collected by the GPM core observatory satellite’s radar (DPR Ku Band). In the 3D image, a view from the south shows that less precipitation was occurring in the southern side of the tropical storm. At the same time the strong convective storms north and northeast of Xavier’s low level center of circulation are shown reaching altitudes of about 6.9 miles (11.1 km). GPM is a joint mission between NASA and the Japan Aerospace Exploration Agency, JAXA. 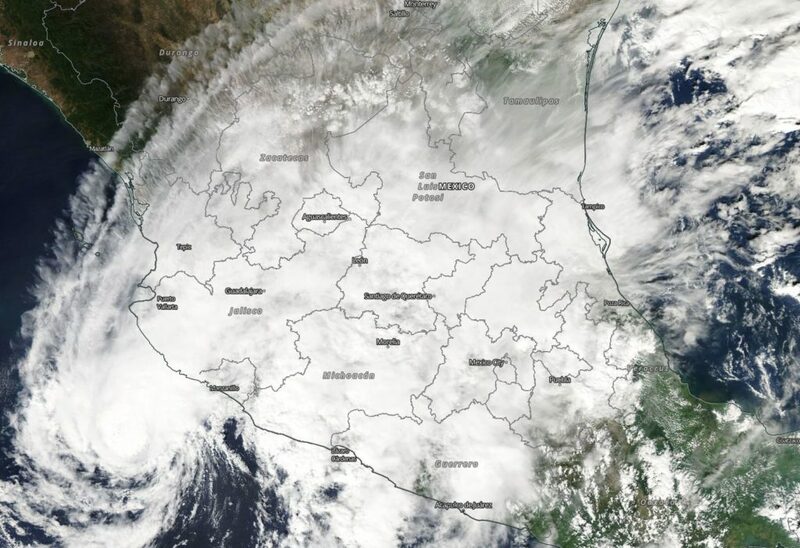 Visible from NASA’s Aqua satellite revealed the extent of Tropical Storm Xavier into western Mexico from its position just off-shore from Mexico’s Jalisco state. Tropical Depression Twenty-Five-E (25E) formed on Nov. 3 and strengthened in a tropical storm on by 11 p.m. EDT that day. When it became a tropical storm it was re-named Xavier. Xavier has continued to hug the coast of western Mexico since it formed. On Nov. 4 a visible image from the Moderate Resolution Imaging Spectroradiometer or MODIS instrument aboard NASA’s Aqua satellite showed an organized storm with a thick band of powerful thunderstorms circling the center. On Nov. 5, a Tropical Storm Warning is in effect for Punta San Telmo to Playa Perula, Mexico. A Tropical Storm Warning means that tropical storm conditions are expected somewhere within the warning area. The National Hurricane Center noted at 11 a.m. EDT the center of Tropical Storm Xavier was located near latitude 18.5 degrees north and longitude 106.2 degrees west. Xavier is moving slowly toward the west-northwest near 3 mph (6 kph), but an increase in forward speed is expected later today. Maximum sustained winds are near 60 mph (95 kph) with higher gusts. Weakening is forecast during the next few days, and Xavier is expected to degenerate into a remnant low by Tuesday night. Tropical-storm-force winds extend outward up to 115 miles (185 km) from the center. The estimated minimum central pressure is 999 millibars from the center. The estimated minimum central pressure is 1006 millibars. NHC said that Xavier is expected to produce total rain accumulations of 1 to 3 inches over coastal sections of the Mexican states of Colima and Jalisco, with isolated maximum amounts of 4 inches possible. This rainfall may produce flooding. Swells generated by Xavier will affect portions of the coast of southwestern Mexico during the next few days. On the forecast track, Xavier’s center is expected to remain offshore the coast of southwestern Mexico and continue to move farther away from the coast today.